Recently Binance launched their Binance V Label Project. According to their own description the purpose of the V Label Project is “to help ensure users obtain timely updates on crypto projects, as well as trustworthy, accurate, and comprehensive information”. 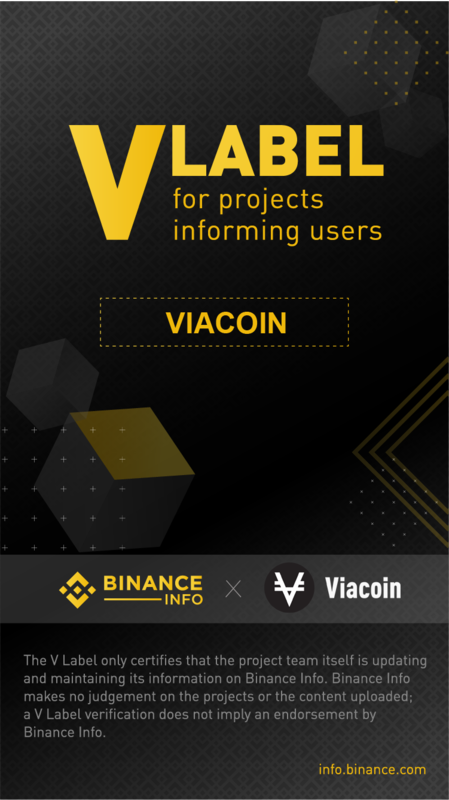 The V Label badge received by projects means the information and content shown on the project’s profile page on Binance Info is verified to be maintained by the project team itself. The Viacoin team is thrilled to announce that our application has been approved. Being rewarded with the V Label means that we are able to supply the 10 million user community with verified information about our team members, Viacoin news, real-time market data, Viacoin community platforms and more.